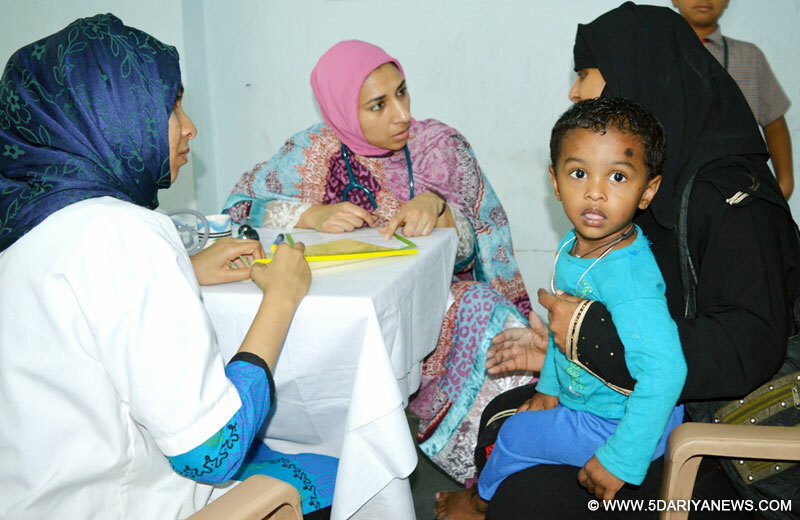 Indian Muslim Relief and Charities (IMRC), a US-based relief organization organised four day free health camps for needy in slum areas of Hyderabad city of Telangana state under its annual Indian Health Initiative (IHI) which concluded on Monday, February 29th. 2300 patients were examined during the four day long medical camps in four different slum areas of Hyderabad city, which were also provided with free investigation of vital health signs and free medicines.IMRC’s free health camps started in Hyderabad on Friday, February 26th from Bright future school in Hasan Nagar where doctors examined more than 600 patients. On Saturday, February 27th, free health camp was organised in IndoUS school, Kishan Bagh where doctors examined 632 patients. On Sunday, February 28th, free health camp was organised in IndoUS school, Baba Nagar where doctors examined 545 patients.On Monday, February 29th, free health camp was organised in IndoUS school, Shaheen Nagar where doctors examined 450 patients. IMRC is organizing annual India Health Initiative for poor and needy this year for the seventh consecutive year.Every year, IMRC assemble team of doctors from the United States to volunteer for the health camps organized by its India wing Sahayata Trust to provide medical care to economically poor patients, who otherwise would not be able to afford the high cost of treatment. This year 10 US based NRI doctors with different specialties are volunteering for the health camps.“I am having serious complication in both my eyes which forced me to give up my tailoring job midway due to the deteriorating vision. I am left with little money to feed myself and my wife so; I can’t afford to pay for the local doctor fees. I found this health camp as an opportunity to get examined free by best doctors without paying anything,” says Mohammad Khwaja, 75, from Kishan Bagh, Hyderabad.Another patient Maheen Banoo, a six year old girl studying studies in local Kindergarten School. Her father sells vegetables on a cart and hardly earns Rs 150 per day. She was found having viral skin infection, warts on her face.Dr. Farook Badi Uddin, Paediatrician, who volunteered for IMRC’s free health camps this year, said, “In last four days of free medical camp, I found rickets more prevalent among children’s here. I diagnosed and referred them to the appropriate clinics. Besides, I got patients with poor nutrition, respiratory tract infection and also I got children’s with scabies which I found more common in here.”“Here, most of the women patients I got are having dysfunctional nutrition which leads to many complications in their bodies like heavy bleeding, body ache and poor strength,” said Dr Farida Ghoghawala, Obstetrics Gynaecologist , who has volunteering for IMRC’s IHI since last four years. Manzoor Ghori, Executive Director of Indian Muslim Relief and Charities (IMRC) said, “The four day free health camps in poor areas of Hyderabad went very well. IMRC’s main motive is to percolate help down to the needy and poor people who are in dire need of health care attention and by Allah’s grace; we are able to move forward in this direction.”Over 1500 patients were examined during the four day long medical camps in Barabanki, UP, held last week as a part of IMRC’s IHI. They were provided with free pathological tests, X ray and free medicines.In the last week of 7th Indian Health Initiative (IHI), the free medical camps will be conducted in Kerala from March 3rd to March 6th 2016 .